Provide easy access to your Elucidat learning content and track it with industry leading analytics. 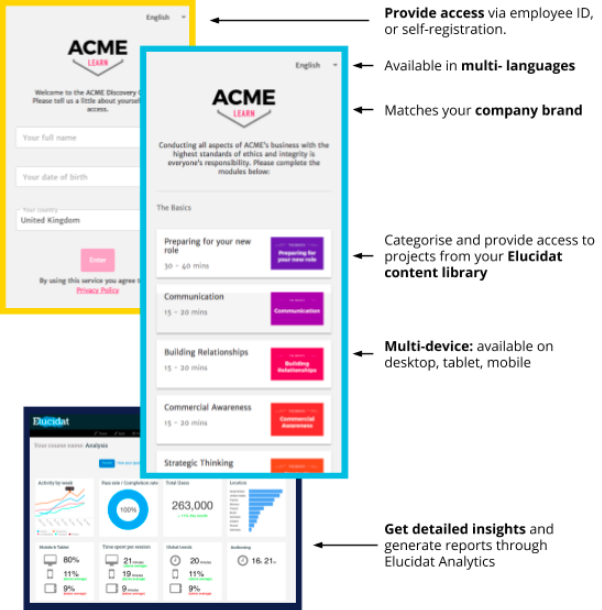 The Learning Discovery Center enables you to make your content more widely available, allowing you to go beyond your LMS to reach brand new audiences. Combined with our advanced analytics suite, you can track and measure participation in your learning programmes - gaining an unparalleled level of reporting detail. The Learning Discovery Center is the simpler, more cost-effective way to deliver your Elucidat content to a range of different audiences, without an LMS.